Let me start by saying that Babyccinos is not in Leeds. It’s not even an LS postcode. There’s no Leeds link that I can try shoehorn in, but because it’s That Good, I’m blogging about it anyway. Besides, as Babyccinos is in Mirfield and therefore a 20 to 30 minute drive away from Leeds City Centre, it’s actually quite a good distance if you’re hoping your little one will have a nap in the car before you get there. 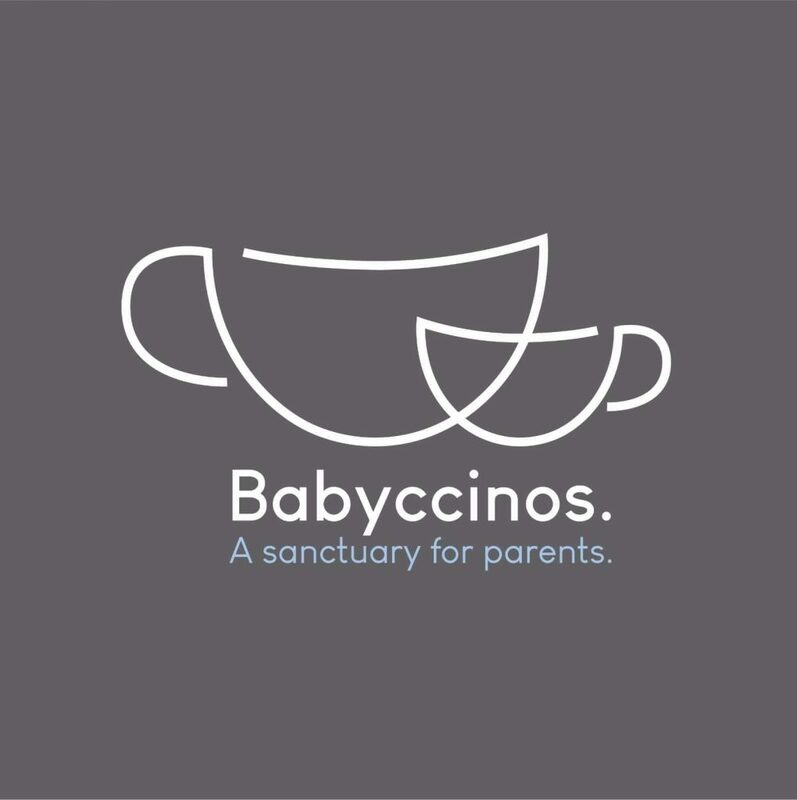 So what is Babyccinos and why am I such a fan? 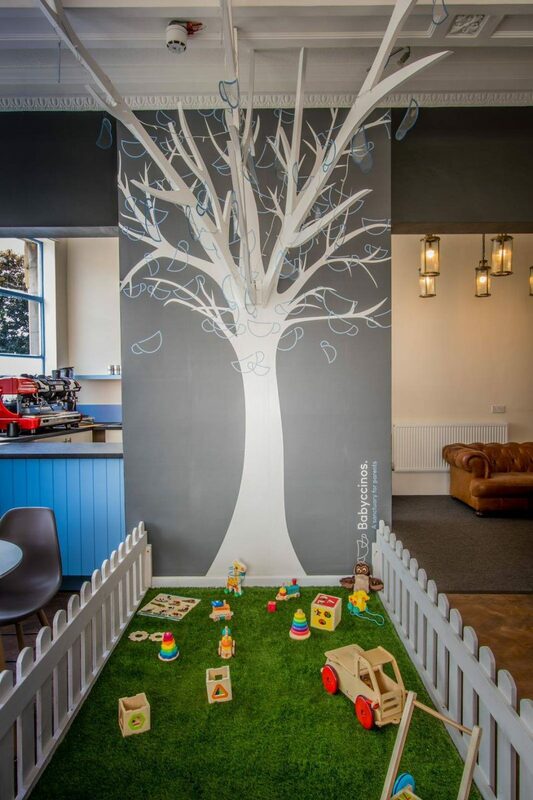 Babyccinos is a cafe on the main road in Mirfield that caters for parents with young children. Now Baby is one, he’s no longer content sitting in his pram for an hour whilst I chat to my mum friends. He needs somewhere to crawl around and I just can’t face soft play gyms. I find it stressful rather than relaxing wondering where he’s escaped to and if another bigger child is going to knock him down. I also fear the day that he’s actually going to be able to go into the older children’s area in case he gets stuck and I have to go in after him. The likelihood of me getting stuck in one of the tunnels or down the slides is very high, and that will be both mortifying and stressful. At Babyccinos however, there is a small “garden” in the middle of the cafe for babies to play in, with chairs and tables around it so you can just lean over and pick up your child without having to actually get in yourself. The baby garden looks adorable with its artificial grass and white picket fence. There are some lovely sensory toys in there as well as some wooden toys for the slightly older babies. For toddlers, there’s a separate forest themed room just off the main eating area with a den, fancy dress station and craft materials. There’s a CCTV screen in the cafe so you can watch your child play safely without having to keep getting up from your seat to check they’re ok. The food. Babycinnos isn’t a play area for children that happens to also serve food. It’s a cafe that serves great quality food that happens to also be a place for children to play. The menu is brilliant – there’s breakfast, brunch and lunch items; a great mixture of savoury and sweet; and something for the kids too. The pastries are freshly baked so are deliciously hot and crispy and oh my goodness the cakes are amazing. Table service. I would have thought having table service was an obvious one, but I’m amazed at how many cafes aimed at parents don’t have this. Do you try balance holding a child in one arm and a cup of boiling hot coffee with the other hand, or do you leave them at the table, never breaking eye contact, wishing the person in front of you would hurry up and decide whether they want white or brown bread so you can rush back to your child? There are also highchairs at every table so you don’t need to rearrange furniture to try and drag a chair from halfway across the room. The staff. Whenever I’ve been the staff have been amazing. As well as being good at the obvious – taking orders, knowing the menu, answering questions etc – they are great with the kids, and sympathetic to the parents! I’ve seen a few parents pass their babies over to staff for a cuddle when it hasn’t been too busy so they can quickly wolf down their food. Changing facilities. As you’d expect, Babyccinos has great changing rooms. I noticed a bouncer in one room and a jumparoo in the other so you’ve got somewhere to put your child if you need to pop to the loo yourself. Classes. 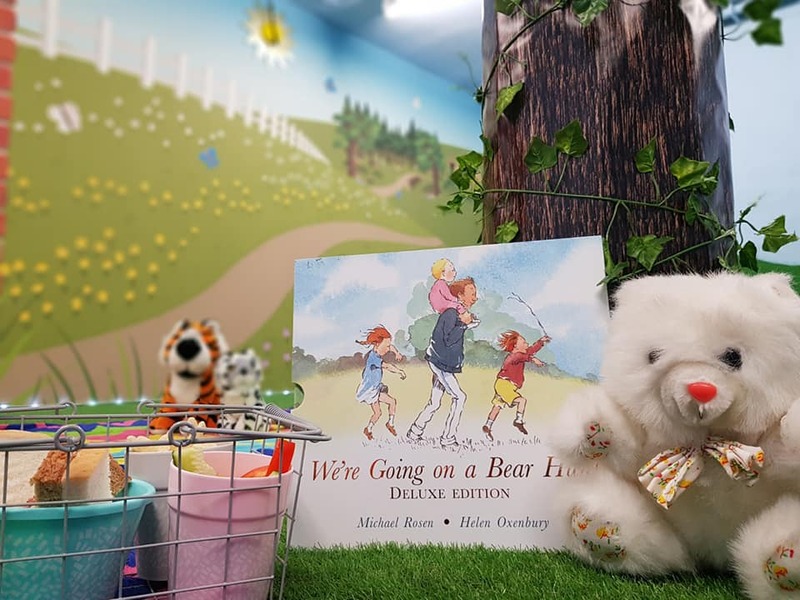 From Teddy Bears Picnics, to bilingual singing sessions, there are loads of different events for babies and toddlers in the meadow room downstairs. I’m looking forward to when Baby’s a bit older so I can take him to one of the toddler discos! To find out what’s on at Babyccinos, visit their Facebook page. Pampering sessions. 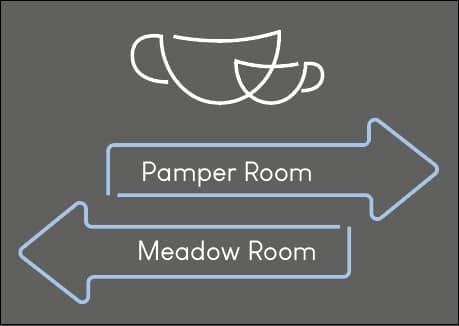 The first time I visited, I noticed a menu on the wall, but instead of listing food, there was a list of pamper sessions! You can book to have a massage, beauty treatment or hair appointment, whilst a qualified member of staff looks after your child. Amazing. Free parking. There are plenty of parking options nearby. I park in the library car park (same entrance as the Co-Op car park) as you can have three hours free parking there, but there’s also the Co-Op and Lidl car parks where you can stay for two hours. It’s very close to Mirfield train station too. I will say don’t be put off by Babyccino’s appearance from the outside. The cafe doesn’t look too inviting as you can’t see inside (but this is a bonus as breastfeeding mammas have a bit more privacy and don’t need to worry about strangers gawping at them from the street) and there are a few steps to get in, but you can just ring the bell and someone will come give you a hand if you’re struggling with a pram. Inside, it’s bright, clean and friendly – a really lovely place. The day after I went to Babyccinos I saw a couple of friends online had also recently visited it. Then another couple of friends mentioned it to me. I can see word-of-mouth has played a big role in Babyccinos’ popularity and I suspect it’s only gong to get busier. This is quite a long post for just one cafe, but it really is the best place I’ve been to as a parent. I wouldn’t be surprised if I found myself there weekly, knowing I can actually enjoy a hot drink in peace whilst Baby plays next to me, and that I won’t be judged for leaving a trail of half eaten food under the table after attempting to feed him. If the team could just replicate Babycinnos in Leeds now please, that would be great!